I’m excited to announce that we will be continuing our partnership with Third Street Music School this year, with a brand new rock band program. We will be piloting this year with select groups of fourth and fifth graders. There will be group instruction during the school day in electric guitar, bass, keyboards, drums and vocals. I know, it’s so awesome! If you have any rock band instruments currently collecting dust in your apartment that you would be willing to loan or donate, please let me know. And, if your child is more the violin type (that’s cool too!) we have a closet full of student violins in good condition that we are looking to sell in order to raise capital/make space for our new program. Please let me know if you are interested. This is your chance to showcase your cultural heritage and your talent! What a wonderful, uplifting morning of song and cheer our children (and the parent band) gave us this morning. At times like these, it is heartwarming to see the talent and passion in our school community. After watching our kids sing their hearts out, we want to let you know about, especially our newer families, a timeless collection of songs that our student and parent body created just a few years ago, Songs from the East Village. Some of you may have seen the Parent Association selling the CD this morning and at other events and wondered what it is. This year the Festival of Lights will be back in our own Auditorium on Wednesday, Dec 18. The kids have already started working on their performances and for the last three years the parents have provided accompaniment for some of the classes as well as cheerful, incidental holiday music as the classes get on and off the stage. We’ve also had a sing-along of a couple of popular holiday tunes for the whole community. If you have an instrument and would like to play you are more than welcome. I will schedule a couple of different rehearsals to try to accommodate everyone’s busy December – So please email me at fondita@gmail.com if you have any ideas, requests or hidden talents! uncles/nieces/nephews/cousins who want to know what sort of NYC public school your daughter/son gets to go to. You can also purchase it digitally from Amazon or iTunes. Totally worth it. This year the Festival of Lights will be at the Earth School Auditorium on Wednesday, December 19. The kids have already started working on their performances, and for the last three years the parents have provided accompaniment for some of the classes as well as cheerful, incidental holiday music as the classes get on and off the stage. We’ve also had a sing-along of a couple of popular holiday tunes for the whole community. If you have an instrument and would like to play you are more than welcome to join our parents’ band. Email Martha Kessler, let her know your hidden talents, ideas, or requests. She will be scheduling a couple of different rehearsals to try to accommodate everyone’s busy December. Nearly all of the PA budget goes to pay for enrichment programs that the school budget no longer covers: music, Spanish language, and theater arts. If it weren’t for parents providing all or most of the funding for these classes, they simply would not be available to our children. To make sure that we can continue to provide this kind of programming at EVCS, we have one last fundraiser for the school year, the EVCS ¡Fiesta! on May 5. Please consider buying your tickets online right now and volunteering for the event. Grades K-5 receive weekly theater instruction for half a year. Kelli Holsopple started InFlight five years ago with one class and she has grown the program every year to now include K-5th grades. The PA has supported the Theater program as it has grown, and this year the PA was awarded a grant from LMCC to cover part of the expense. InFlight, a program of Phoenix Theatre Ensemble, is based on the idea that children’s natural inclination toward play and imagination is a powerful vehicle for learning. Using interactive, process-based theatre as a teaching method, students explore social studies topics combining content area exploration with social justice issues, critical inquiry, literacy, and community building. Kelli collaborates with teachers to choose a unit of study to focus on. Students become characters tasked with a project, mission, or journey. They fully take on their roles and through interactive theatre they experience a journey during which they must interact with characters played by Kelli and the teachers, working together to creatively solve problems that arise. This fall, the Kindergarteners traveled back in time to become workers on the Transcontinental Railroad, singing railroad work songs, building, meeting characters (including a prairie dog! ), and solving problems along the way. After their journey they were hired to design green transportation of the future and the drama ended with a green transportation fair during which they shared their inventions and the story of their journey back in time. Currently, Kelli is working with the 5th grade. The 5th graders are delegates to the United Nations from different nations in the Western Hemisphere. Last fall in social studies, they completed a nation study and now they are using that knowledge to research and write resolutions about current issues effecting the Western Hemisphere: poverty, environmental issues, education, unemployment, healthcare. The are presenting, debating, caucusing, writing amendments, and giving speeches in very lively UN sessions. The 3rd grade are in-role as International Detective Agency Agents who are tasked with stopping an international thief from stealing world treasures. Their latest clue leads them to believe that the thief is headed to Kenya so they have been learning all they can! If you see a 3rd grader, find out what they know about Kenya! Grades K-5 receive weekly Spanish instruction for 30 weeks. EVCS has had a successful Spanish program for many years. 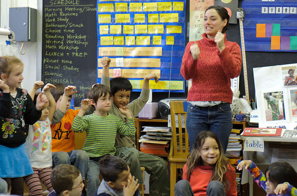 The younger children in kindergarten and first grade are introduced to Spanish through music, movement, and games. For grades 2-5, the older children are introduced to more complex sentences and some basic grammar. The Spanish teachers work with class teachers to align the program to compliment social studies and class projects. Spanish classes for Kindergarten, 1st grade, and Christine’s 12-1-1 class are taught by Alfonso Mogaburo. Alfonso is a native of Spain, and a talented musician. “I incorporate music, role-play like shopping at the market, and aspects of Spanish culture into the curriculum,” Alfonso says. He finds that keeping kids active with a variety of exercises helps the students stay focused and absorb more. “I don’t just make them sit and listen. They practice speaking and working with each other while using Spanish,” Alfonso explains. This is Alfonso and Mary’s second year teaching Spanish. In addition to the language, they teach about the different aspects of Latin cultures, which are already a part of many students’ lives either through their own families or just from living in New York City. From Family Contributions to Read-a-Thon pledges, Fall Ball ticket sales to Spring Gala auctions, EVCS parents are being asked this year to raise a lot of money for our small school — more than ever before. Parents may wonder what it’s all for. The short answer is that nearly all of the PA budget goes to pay for enrichment programs that the school budget no longer covers: music, Spanish language, and theater arts. If it weren’t for parents providing all or most of the funding for these classes, they simply would not be available to our children. Grades K-2 receive weekly music instruction for half a year from Nina Stern of S’cool Sounds. Grades 3-5 receive weekly music instruction for the full school year. Note: Nina will be hosting a music share about her Kenya project on Wednesday March 14th in the auditorium at 10:30. Parents are encouraged to attend. On Wednesday, February 29, parents and children were treated to a great music share by the 1st and 2nd grade students who had completed their music program provided by S’cool Sounds. Nina Stern, who taught the classes, explained to the audience that the children had been learning about the basic skills all musicians need to be able to play together whether using percussion, their voices, or recorders. Nina has just returned from Kenya where she is part of a team of educators building a school in Nairobi. 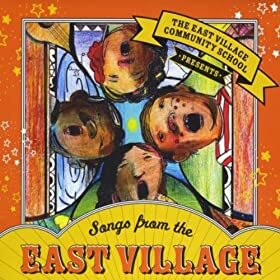 She shared our EVCS CD “Songs from the East Village” (Amazon, Amazon MP3, iTunes) with the children there and has brought some of their songs back with her to share with our children. Her hope is to establish a long-term relationship between the two schools where the children can learn about each other’s cultures and traditions through music. The older children at EVCS — 3rd, 4th, and 5th graders — have had weekly group violin classes with Sam Marchan from Third Street Music Settlement, the oldest community music school in the country. The children are being taught using the Suzuki method which was devised especially for groups of children and is used all over the world. We heard the 4th and 5th graders perform at the Festival of Lights and will hear all three grades at our year-end music share. Third Street Music Settlement has many levels instructions for children and adults. Every EVCS student 6 years and older is eligible for their MILES program which gives two years of free classes at Third Street. Sign-up is at the end of May for classes beginning the following fall. Keep your eye out for information if you are interested in taking advantage of this program.